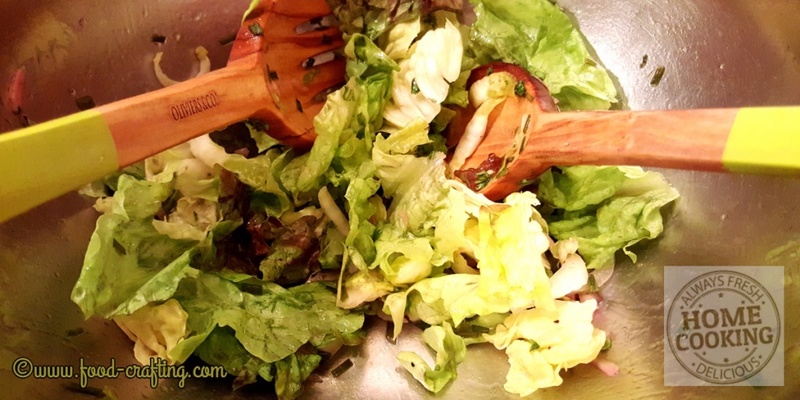 Simple Vinaigrette Salad Dressing – Every dinner – and sometimes lunch – is accompanied by “une salade verte”. Often mentioned throughout our collection of French country cuisine recipes, this is the salad we prepare. 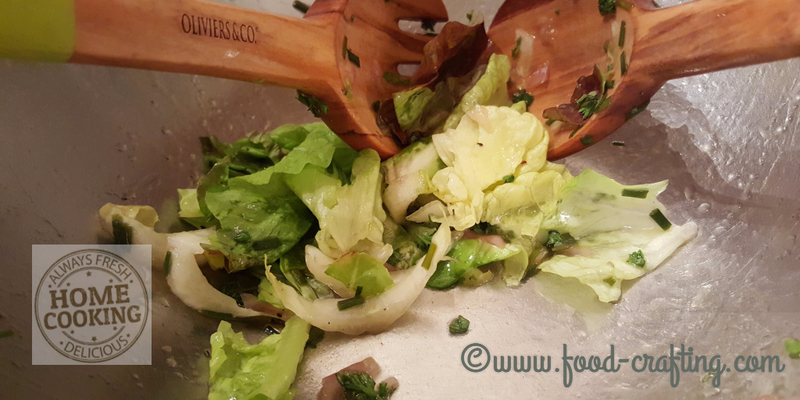 Somehow, dinner is not complete without a big bowl of mixed tossed salad lettuces or a specific green lettuce. A simple vinaigrette – get this one right and you have it “made in the shade” when it comes to everyday cooking chez nous. There are 101 variations on the vinaigrette salad dressing but master the proportions first. Then make it your own. ==> Check out these interesting kitchen finds including beautiful olive wood salad servers! Mom’s everyday salad servers (seen in the photo) have bright and colorful lime green handles. The Moms in our family are not likely to forget that part of the meal because we get the immediate “où est la salade?” question. In her potager, my grandmother grew plain laitue (what you can currently buy as Butter Head Lettuce) as well as frisée (curly endive). Chopped Belgian endives were a regular addition to the salad bowl. At my grandparents, my cousin and I would regularly fight over the bowl of green salad. Who would get to soak their piece of baguette in those last delicious drops of vinaigrette? Grandmère’s vinaigrette brought to life even the drabbest leaves of lettuce. It was the perfect blend of oil and vinegar, enhanced with a pinch of coarse salt, freshly ground Tellicherry pepper, with snipped chervil (French Parsley) and chives or French tarragon from the garden. By the way, tarragon is super easy to grow in the garden! Fortunately for everyone, the recipe (I should say the formula) for Meme’s vinaigrette was handed down from mother to daughter and grand-daughters, garnering the same rave reviews today as it did back then. Regardless of the size of the spoon – tablespoon or salad serving spoon – a 2 to 1 ratio of your favorite olive and red wine vinegar, along with a dash of salt and pepper, will produce a smooth perfectly balanced vinaigrette every time. My sister uses a 3 to 1 ratio with equally smooth results, especially when she includes chopped shallots and herbs. It all depends on the mild or robust flavor of the oils and the acidity level of the vinegars. Prefer a more acidic flavor? Use a 1 to 1 ratio. Add one spoonful of vinegar – I use the spoon from the salad server to measure and recommend Regina but if this is your first try, use a regular tablespoon to measure accurately. Stir the salt and vinegar until the salt is completely dissolved. Add freshly cracked pepper, minced shallots, crushed garlic, snipped herbs, and any other seasonings to the salad dressing such as blue cheese and Dijon mustard. Emulsify the ingredients with a fork or a special “gadget” like the Emulstir. Do not add the lettuce greens until you are ready to toss and serve the salad. Today, top salad oils such as Olive, Walnut, Avocado, Grape Seed and combination olive/canola oils as well as kinds of vinegar – red wine, raspberry, pear, red or white balsamic, etc. – are inexpensive and readily available. Which Vinegar Do I Use? Find the right vinegar and oil combination for your taste buds and you will never go back to bottled dressing. Red wine vinegar from Heinz®, Regina® or Pompeian® are inexpensive and the perfect choice when making your first salad dressing. What you will quickly discover is that different vkinds of vinegar have varying amounts of acidity. Both these brands have 5% acidity which is considered a mild level. I’ve found that being heavy handed with the vinegar (resulting in too much acidity) makes it virtually impossible to recover the dressing by adjusting the amount of oil. Practice make perfect and before you know it, you too will be using the salad servers – with great success – as measuring units. I have successfully used a blender on low speed in blend mode to prepare a simple vinaigrette. 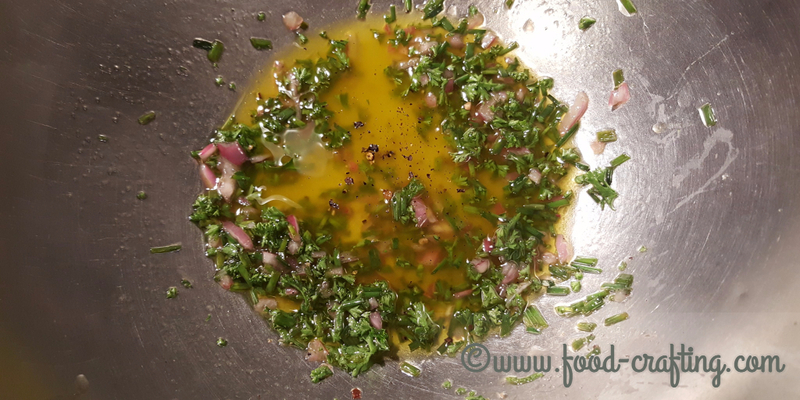 Even on a slow blend mode, a blender will transform the shallots, chives and parsley into specks of flavors. The vinaigrette will taste just as good. The dressing will look more like the homogenized blend found in a bottle but it will taste a thousand times better! So – no worries. Use your Blendtec Wildside and a blend or mix setting. Add the herbs, garlic or shallots later. You can also use containers like salad dressing mixers. Proportions for several types of vinaigrette are marked on the container itself. Some home cooks prepare enough vinaigrette to last through the week but I prefer to make a fresh batch every evening depending on the lettuce and combination of salad ingredients. It only takes a few minutes to make a unique salad dressing! 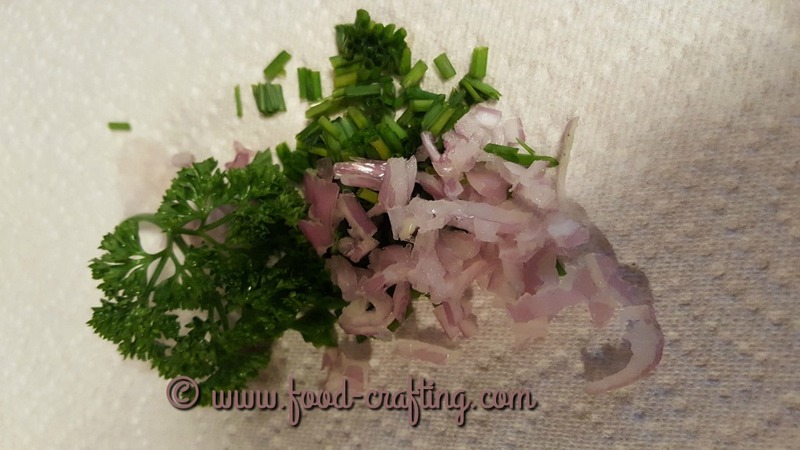 Parsley, snipped chives and minced shallots. You can stick with the traditional vinaigrette or doctor it up to suit today’s favorite greens. Whole grained mustard for a German potato salad. This easy vinaigrette salad dressing is also the base for the family’s favorite old-fashioned potato salad! Make Sure The Lettuce Is Dry! Grandmère had a special kitchen towel reserved specifically for this task – la serviette à salade. It was an oversized cotton towel, large enough to pile on the lettuce leaves. All we had to do was grab the four corners to create a handle and shake until the towel no longer dripped. Later she bought a mesh basket. Imagine her delight when they first came out with salad spinners! I still have the orange one she gave me in the 70’s. Now spinners come in stainless steel or plastic, single portion or collapsible. 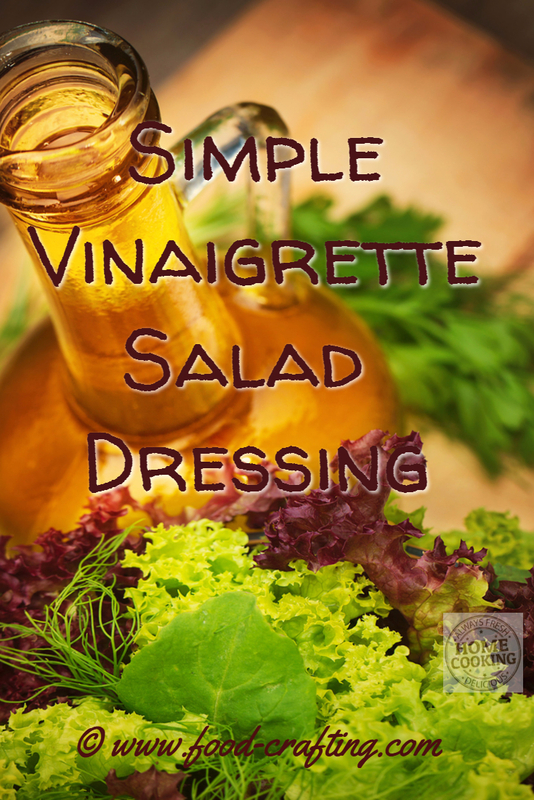 Master the basic vinaigrette and your options of fresh oil and vinegar based salad dressings are limitless. There’s only one problem with a vinaigrette. Pour it on your lettuce greens, toss the salad and eat it within 30 minutes otherwise, the lettuce leaves begin to wilt. It is not as obvious if you use iceberg but then again, iceberg does not benefit at all from this dressing – unless you are making my antipasto salad. It uses an Italian variation of the basic vinaigrette, iceberg and romaine. Believe me when I say that my daughter loves to eat day old salad but it is definitely something you eat at home, by yourself, in a corner. 🙂 She’s willing to do that. Take your salad dressing to work! If you want to take your salad with you to work, there are multiple options. Pack the lettuce leaves in a zip lock bag and the vinaigrette in a tightly sealed container and toss together at lunch time. Or use a neat salad to-go container! Your taste buds will quickly understand why that bowl of salad was worth fighting for then and still is today. Mom’s salad bowl is a vintage frosted and hand painted glass bowl with vines on it. It’s been on the table since the 1950’s. 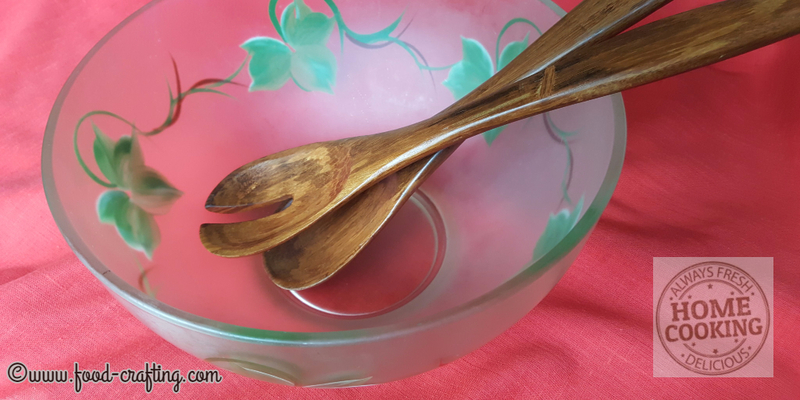 Maman’s salad bowl from the 1950’s – still in use today. We bought her a bigger and deeper white ceramic bowl much like this one when making salad meant going from 4 servings to 8 or 10 or more! Everyone loves her salad and it is always the centerpiece of any gathering. By the way, we all still tangle over the last few leaves of lettuce. Mine is a wooden bowl but I also have inexpensive plastic bowls from the Dollar Store when I mix salad for a crowd – green, pasta or potato salad. No worries when we take it out on the patio. The beauty of it is that, on the dinner table, the salad bowl stands alone stylewise so go for originality – make it a statement! Just smile, tell your guests the recipe comes straight from a French country cook and serve a bowl full of fresh greens tossed with a perfectly balanced simple vinaigrette salad dressing! 3.2 Which Vinegar Do I Use? 5 Make Sure The Lettuce Is Dry! 6 I Want My Vinaigrette! 6.1 Take your salad dressing to work! Previous Post Best Meat Chili Recipe: Special For Big Meat Lovers Everywhere Next Post Game Day Menu Recipes: Most Popular Easy Super Bowl Food!